WhatsApp in its latest update have added a new feature silently which allows the user to know when your message was been read by the recipient. Previously WhatsApp used to show only one tick mark when your message was sent, and when the message was to get delivered it used to turn into two grey ticks. So now after updating WhatsApp to latest version the app shows two blue ticks when your message have been read by the recipient. Some users of WhatsApp after updating to latest version are not satisfied with this new added feature which shows blue seen ticks so for all those people who are looking around for solution to disable or remove blue ticks for read messages in WhatsApp we have a perfect tutorial on how to disable WhatsApp blue ticks. From your Android device go to Settings> Security> Check Unknown Sources so that you will be able to install the apps available outside Google PlayStore. After the WhatsApp.apk file gets downloaded on your device, install it. And once the app gets installed on your device, open the app and follow the below given steps to get rid of WhatsApp blue ticks. 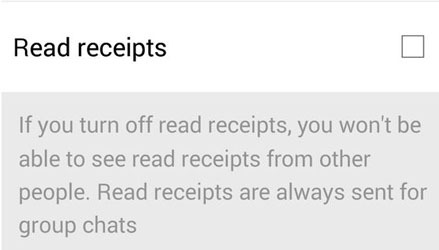 And to disable the WhatsApp blue ticks just uncheck the “Read Receipts”. 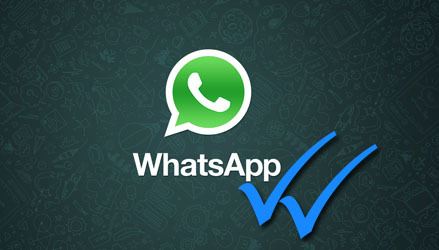 After you are done in setting these things now you will not able to see any blue ticks on WhatsApp, as of now this feature in WhatsApp is not available in the apps available in the Google PlayStore or other market platforms but you will only able to disable this feature by downloading the WhatsApp from official website and once the same WhatsApp.apk gets available on all platform to disable the feature blue ticks in WhatsApp we will update you. After disabling WhatsApp blue ticks by turning off read receipts you will not able to see read receipts from other people as well, and for group chats this feature is not applicable as it will let know group chat members when the message was read. You can also learn how to download WhatsApp for PC.